The rolling hills and natural curves of the Texas landscape served as inspiration for the design of the Christ Chapel West Campus in Willow Park, Texas. The building’s organic spaces have curved ceilings and flooring to establish a natural flow that connects with the surroundings. These curves were created with Flex-C Trac from Flex-Ability Concepts. The big curve impact was accomplished with 480 linear feet of 6-inch Flex-C Trac and 1,000 linear feet of 3 5/8-inch Flex-C Trac. The 20-gauge system was installed by Rice Drywall Inc., Burleson, Texas, and distributed by Cowtown Materials Inc., Fort Worth, Texas. Christ Chapel West had a leadership dedication on September 11, 2016 and opened to the public on September 18, after one year of construction. The expansion provides a permanent home for Christ Chapel to offer services, education and ministries to the community beyond its Fort Worth site. The worship center seats 625 people and has state-of-the-art audio and visual technology. The children’s building includes classrooms for children in nursery through sixth grade. The space features a multipurpose room for elementary worship, fifth- and sixth-grade silo, and Special Friends room. The student complex also has outdoor sports and play areas. 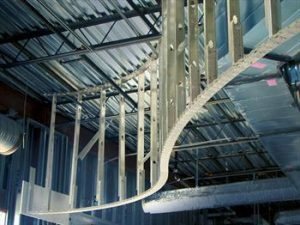 Between the rigid forms occupied by the children’s building and worship center is a lobby, designed to be an open gathering space filled with curves and a free flow. Flex-C Trac was used primarily at the window wall of the lobby, which faces an oak tree grove. Martsolf said the curves on the ceiling and floor lead occupants to the window wall to admire the sights.